The Localism Act 2011 introduced a number of provisions including the reform of the planning system and the introduction of a new regime for neighbourhood planning. A central part of the Localism Act is the right for communities to produce a Neighbourhood Development Plan (NDP), allowing people to shape the future of where they live. Thus, in 2011, Little Dewchurch was identified by the Government as one of the many rural parishes “suitable for development” in order to meet the new housing needs throughout the UK. As such the Parish Council was told that areas suitable for housing development within the parish must be identified in order to meet the required development criteria (an additional 18% of the existing 2011 parish housing, which equates to 26 houses) and a Plan should be drawn up to demonstrate the democratic opinion of parishioners which should show not only how the requisite new houses should be designed and where they should be built, but also to identify an specific areas parishioners felt should be preserved and not developed. In 2011 a small development of 10 houses including 3 affordable houses (The Furrows) was built near The Plough Inn and formed part of the requisite 18%, thus reducing the development need in the parish to 16 houses. The three affordable houses have been rented out via Homepoint but with priority to those with a strong local connection. The Act stated the NDP must have regard to national policies, and conform to local strategic policies, e.g. allow for the extra housing required, in the development plan for the local area which in this case is the Herefordshire Core Strategy, and the National Planning Policy Framework (NPPF). Once adopted the NDP will become part of the development plan and will help inform decisions on planning applications within the Parish. 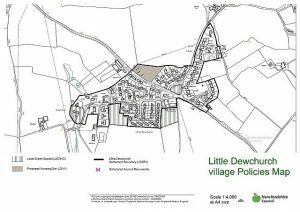 In the early part of 2013 the Little Dewchurch Parish Council agreed that it would follow the recommendation of the Localism Act to write a Neighbourhood Development Plan for our Parish. The aim of the plan was to enable the parishioners of the Little Dewchurch to have an upfront say in how they would like to see the village develop between the years 2011 and 2031. A Steering Group was established to work as a subcommittee of the PC and produce this plan. The Steering Group, as listed, was made up of representatives of the Parish Council, and other independent parishioners of the parish. Herefordshire Council also posted copies on their web pages of the Plan and associated documents. 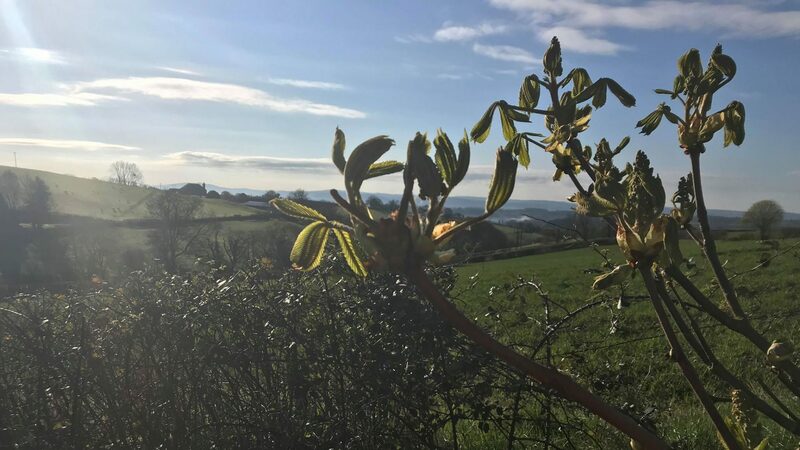 In 2017, after 4 years’ work, “The Plan”, was completed and following an independent review and village referendum, has been formally adopted as part of Herefordshire Councils Core Development Plan. Although “The Plan” is now complete and adopted it should not be regarded as a static document the document provides a guide for the aspirations of the residents of the Parish for the future development of the Parish and both the Parish Council and Herefordshire Council must consult and use it as a baseline for any development in Little Dewchurch until 2031. The LDNDP document, can be viewed on the Public Documents page under NDPC. The map below shows the development boundary within Little Dewchurch; the beige area is the NDP area for residential development. You can download a copy from the photographs sectipon of Public Documents.